DJ Event Planner's employee tools make it a lot easier for your employees to get the information they need! 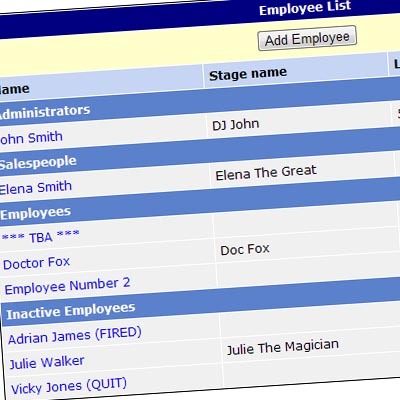 You can assign employees login details, which enable them to access a specially designed version of the dashboard with information specific to them. There are also a wide range of tools available to help you manage your employees too! Your staff will be able to login and see a lot of information regardng their assigned events (you decide what information is shown from your control panel). However, the one thing they are probably really wanting to know is "How much will I be paid?". You can assign a wage for each event, helping to keep your financial records in order; your employee is able to see straight away how much they are expecting to get from the event. The dashboard allows them to see any notes that you have left them personally. They can also see any announcements you've made company wide. It provides them with a calendar which has all their upcoming events, appointments, and more! This allows them to quickly view the month ahead and plan accordingly. How annoying and time consuming is it when you have to send multiple emails to multiple employees regarding multiple events? With DJ Event Planner, you can now send event details quickly and easily using the automated actions. Not only that, but your employees can log in and see the event details you want them to see straight away! One other major feature is being able to track your employees actions on the system! Everytime an employee logs in to your Multi-Op online planning system, a record is left in your administrative area. You'll be able to see what changes/edits have been made by the employee.